Those spearmen aren’t the best soldiers the Romans can field. Truth be told, they aren’t even soldiers. A good many of them are servants, or as their name means “followers”, riff raff which followed armies on the move back then. Local militia forces from the now disbanded “Themata” are joining in as well. A mass production iron helmet with leather strips or padded aventail, a “Kontarion” spear and a plain wooden kite shield, which is the sole means of protection, as they lack any real armor, but for the simple gambeson “bambakion” ¾ of an inch padded cotton cloth they wear. They are expected to stand and maybe hold the line, not actually fight through or break the enemy. They may actually do that, but it would be the exception rather than the rule. 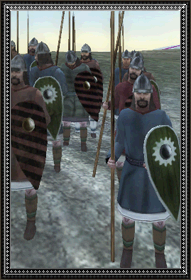 The absolute need to field spearmen, lack of funds as well as the decreasing lands from which they could be recruited from could only mean one thing. Spearmen with the absolute minimum in training and equipment needed to do the job. The akolouthoi are a force of spearmen, who are soldiers in name only. They should not be expected to fight till the last man, as they will flee much before that. Still necessities of war mean that they should fight. They will carry the day, if properly supported but a growing Roman Empire should hire better spear units and leave those behind for garrison duty, whenever possible. Those aren’t soldiers, but rather better equipped militia and shouldn’t be expected to fight as soldiers would. Desperate times call for desperate measures, though.